Ideas of site and non-site and place and non-place are integral to my work. Through the metaphor of the TV or computer screen, and formal references to landscape and the natural world, I am seeking to address the notion of remove and distance, as well as that of belonging and situating. History and site are inextricably linked through cultural identity and memory. I am interested in the layers of representation that bombard us through popular culture, historical reference and through particular forms of graphic representation that are prevalent in contemporary art and design. The TV screen transports us to a represented reality that is isolated and manipulated. It is a subjective mediator of information and experience that is never the less understood as a collective experience. My use of sculptural materials is important in the sense that they can also be manipulated, subverted, and recontextualized. In my work, ceramic surfaces simulate the smooth screen of the computer monitor, painted surfaces bounce back and forth between two and three dimensions. The reductive nature of forms and surfaces lead to associations that have more to do with the virtual surface displayed on, or in the computer screen. My use of light and Plexiglas further this dislocation, through the use of shadow and reflection. 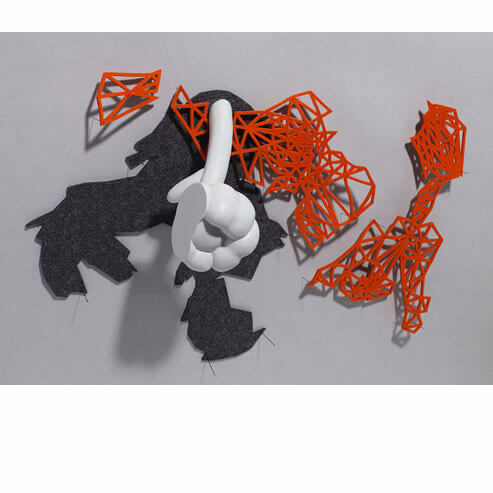 References to nature and landscape in recent works manifest in reductive and topographical modes, which combine technologies both traditional and contemporary; the hand- formed and intimately worked with the computer designed and fabricated. These forms and mappings, which often refer specifically to an actual place reinforce the idea of remove, and the re-situation of place as a cultural construct. Communities define themselves through the history of their landscapes, be it rural or urban. As place and places are becoming more homogenized by mass modes of representation, the cultural importance of particular places and histories are being superceded. The historical ties to identity that are bound to site are replaced by displacement, isolation and longing.